It’s too close to call…. The winner will depend on which has a party majority not vote majority…. Netanyahu doesn’t look good no matter what…. We are seeing exit polling numbers AND some of the actually vote numbers still coming in…. Israeli exit polls, however, indicated Likud and the rival Blue and White party are locked in a race that is too close to call, The Associated Press reported. 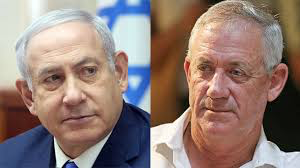 Channels 12 and Kan TV gave the Blue and White party, headed by Gantz, a narrow lead over the Likud, while Channel 10 TV showed them in a tie in Tuesday’s vote. The channels also gave different breakdowns for possible coalitions, with two stations giving Netanyahu’s right-wing bloc a slight parliamentary majority while Channel 12 had them tied at 60 seats apiece….